I forgot to mention my 1.2 seconds of fame. Last Halloween, a household down the street from us participated in TLC's daily show about straightening up your junk entitled: Clean Sweep. Clean Sweep basically has a host who is this blonde with a pretty bad eye-job (seriously, if she didn't have eye-work done, I'm Winston Churchill), a carpenter and a "professional organizer." Embodying why the rest of the world hates the US, the people living in these houses have just accumulated too much stuff and delight in THAT being their biggest problem. Golf balls. Cabbage Patch kids. There's actually a common theme of too many toys for kids ages 1-4. And, basically, these people dwell in heaps of items bought and never used. But they don't have the heart to toss away the stuff, nor the sense of mind to drive it to Salvation Army. So they bring a lady in who basically throws away their stuff and gives them shelves. That's it. It's totally dumb. Anyway, part of the show entails people having a garage sale in which they sell their used junk, and so Jamie and I wandered down the street to see the garage sale. I was pretty sure if I involved Mel we'd get some screen time, but even as I was signing the release papers so I could be on TV scrounging through these people's leftover plastic and moldy books, I got a sort of sinking feeling. 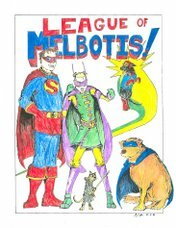 I knew I was never going to buy enough of this useless crap to make it on TV for any length of time, and Mel was pretty much unwelcome. At any rate, I bought what I think is a rare novelization fo the first Star Wars movie, and Jamie bought some lamp we threw away about a week after we brought it home. But we never did see the show. Until Tuesday night. I watched for forty minutes, and then, all too briefly, you can hear someone yell "Wanna buy a lamp?" And I turn and look at the lamp, as if to say "Are you serious?" Jamie is in the background of the shot looking on, and Mel is sort of waddling through the bottom of the shot. The total shot lasts about 1.5 seconds. If that. So that's it. My brush with fame. C'est la vie. It'll be interesting in a few years when they finally take me down, how Access Hollywood or somebody is going to locate that one second of footage and keep replaying it in slow motion to demonstrate my evil.